"Fall Fairy tale festival", "boston", "brookline", "labor Day weekend", "little red riding hood", "perry alley theatre", "puppet show", "snow white", "things to do"
Fall Fairy Tale Festival: Labor Day Weekend Through Columbus Day! FALL FAIRY TALE FESTIVAL KICK OFF WEEKEND! "Snow White & Other Tales"
Join friends and family for a scavenger hunt, special treats, and other festive activities all throughout Puppet Showplace Theatre's Labor Day weekend season kick-off event! A show for the whole family: "Snow White and Other Tales" is a great show for all ages. The content is episodic, interactive, and silly, with lots of jokes that are appealing to younger audiences. The show is also very thoughtful and intellectually creative and appeals to parents and older children who will appreciate the verbal puns and tounge-in-cheek historical references. 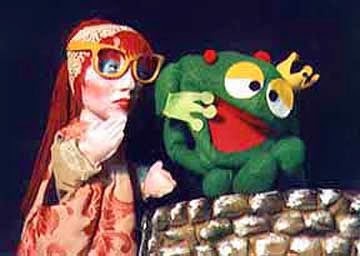 Many different styles of puppetry: The show uses multiple styles of puppetry, including traditional glove puppetry, table top puppetry, and found object puppetry. This show is particularly recommended for those who are interested in creative variations on traditional puppetry performance. To prepare for the show, grown ups may want to explore different versions of fairytales with their children to see how an artist can modify the story. Suggested story books: Can't wait for the show day to arrive? Check out these suggested books to get you into the fairy tale mood. These stories aren't your typical renditions, but unique and creative retellings! Read a fractured fairytale book like "The Stinky Cheese Man" or Compare Disney's "Snow White" to the Brother's Grimm edition or Pushkin's "The Tale of the Dead Princess and the Seven Knights"
Andrew and Bonnie Periale receiving 2013 Paul Vincent Davis award for life time achievement in puppetry. About the artists: Andrew and Bonnie Periale founded Perry Alley Theatre in 1986 and moved to their current home and studio in NH in 1988. Together, they’ve produced a dozen major shows and many shorter pieces for touring. Andrew and Bonnie have performed at numerous national and regional festivals, at the Smithsonian Institution, the Center for Puppetry Arts (Atlanta), the Jim Henson International Festival of Puppetry and many other venues across the U.S. as well as in France and Italy. They have produced the magazines for UNIMA-USA for 28 years, establishing Puppetry International magazine in the early 1990s. Recognition includes The Paul Vincent Davis Award, the George Latshaw Award, 3 Henson Foundation grants, 2 UNIMA Citations, an Emmy nomination, finalists in the International Festival of Film and Television and, from UNIMA-USA, a Lifetime Achievement award.